After you've learned to survive in Minecraft, the fun really begins. Minecraft's advanced features support stunning creativity-and that's still just the beginning. There are custom-crafted adventure maps, massive multiplayer servers, new trading systems, new societies, and incredible mods that take Minecraft into the far future. Minecraft can be whatever you and millions of other players dream up. There's only one problem: uncovering all these amazing resources and techniques. Problem solved! 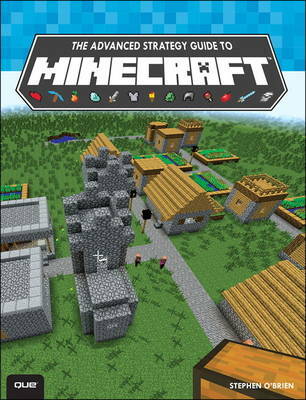 They're all in one great full-color guide: The Advanced Strategy Guide to Minecraft. Don't struggle with out-of-date web tutorials or bewildering YouTube videos: best-selling author Stephen O'Brien will show you how to do it all! Stephen O'Brien is an Australian-born writer and entrepreneur now residing in Sydney after too many years in Silicon Valley. He has written 28 books, including several best-sellers. O'Brien founded Typefi, the world's leading automated publishing system, and in his spare time invented a new type of espresso machine called mypressi. He has played Minecraft since its alpha release and remains astounded at the unparalleled creativity it engenders. He is author of the mega-bestselling The Ultimate Player's Guide to Minecraft and The Ultimate Player's Guide to Minecraft: Xbox Edition.